We understand that finding financing for a Chevrolet Silverado 1500 Double Cab Z71 LT 6.5 ft in Louisville can be a difficult process. At DriveTime, our financing process is quick an easy. Just apply online and get into a 2016 Chevrolet Silverado 1500 Double Cab Z71 LT 6.5 ft in no time. 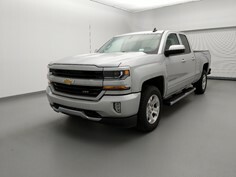 After you go through our two minute approval process, you can see if the 2016 Chevrolet Silverado 1500 Double Cab Z71 LT 6.5 ft with stock number 1240036214 is on the lot in Louisville See pictures, prices and details online. Finding financing in Louisville is hassle-free with DriveTime. Ask about this 2016 Chevrolet Silverado 1500 Double Cab Z71 LT 6.5 ft stock#1240036214 or easily apply online today!